1. More than twice as many women crave chocolate, than men do. Milk chocolate is our favorite flavor of chocolate. 2. The United States produces more chocolate than any other country. 3. If you are depressed, have some chocolate! It produces the mild effects of an anti-depressant in the brain. 4. 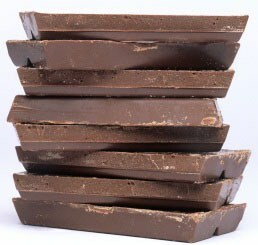 Despite the high fat content, chocolate doesn't appear to raise blood cholesterol levels. 5. Every American and Russian space voyage has included chocolate bars. 6. More than 7 billion chocolate chips are eaten annually. 7. Napoleon carried chocolate with him, which he ate as a pick me up. 8. 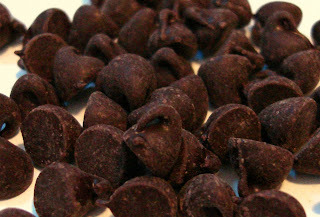 Allergies to chocolate are very uncommon. 9. The shelf life of a chocolate bare is one year. 10. White chocolate, contains no chocolate and has no caffeine. I have been traveling a lot lately. One of the things I enjoy when I travel is reading news papers from the different cities I am in. The first pages I turn to is the Food sections. I love to read about food! There are so many interesting food tips and facts. I think foodies are taking over the world! Almost every magazine now features a recipe, or an article about a restaurant, or about unique food items. I will be going home with my computer bag stuffed with all the articles that caught my eye. Do you tear articles out of magazines and the news paper too? Do you have an interesting food fact or tip you can share? Preheat oven to 425 degrees. Spread 2 cups chili on the bottom of 11x7 or 13x9 baking pan. Spread 2 tablespoons queso dip on each tortilla. Place a hot dog on each tortilla, roll up like an enchilada. Place tortillas seam down in baking pan. Spread 2 cups chili over tortillas. Sprinkle pepper jack cheese over top. Cover will foil. Bake 20 minutes or until heated through and cheese is melted. Preheat oven to 350 degrees. Prepare mac and cheese according to package directions. Spray a 9x9 inch baking dish with cooking spray. In baking dish, combine prepared mac and cheese and 3/4 cup salsa. Mix well. Microwave chicken strips for 3 to 4 minutes or until heated through. Arrange on top of mac and cheese mixture. Spread 1/2 cup salsa over chicken. Sprinkle 1 cup shredded cheese over salsa. Top with crushed tortilla chips. Sprinkle 1/4 cup shredded cheese on top. Bake 20 minutes. One of the highlights of being at the Iowa State Fair was judging cooking competitions! I judged sugar cookies, desserts, scones, casseroles, and bread contests. There are fabulous cooks in Iowa and it is very hard to pick a winner. I am really glad you don't know who makes the dishes you are testing. As it turned out, many of my friends won or place in the contests I judged. My friend Darrellyn, won second place in the, "Quick and Easy 5 Ingredient Casserole Contest", with the above, Southwestern Chili Cheese Dog Casserole recipe. It is a kids contest, and tends to lean to the gross side of things. All I can say about this one is, YUCK! One of my favorite cake contests is the, Kids Animal Face Cakes. It is nice to see kids can be creative it a cute way. The professional cake contest results in some amazing cakes! This would be perfect for a baby shower! If it is a girl, that is. Do you eat this, or wear it? This cake looked even better in person. It was one of my favorite ones! This one looks like it belongs in a contest at the fair. I had a great time at the Iowa State Fair! I am always sad to see it come to an end. Two people who are probably happy to see it come to an end, are the brother and sister who were trapped in a ride high in the air for 2 1/2 hours. Other than a slight sunburn, the pair were just fine. The ride was shut down for a day and a half and then was back up and running. prize winning recipes from the, Iowa State Fair! Preheat oven to 375 degrees. In medium bowl, combine flour, 1/2 cup sugar, and dark cocoa. Mix well. In large bowl. combine egg whites, salt, cream of tarter, and vanilla extract. Using an electric mixer, beat egg mixture until soft peaks form. Sprinkle half of the 1 1/3 cups sugar into egg mixture. Mix well. Add remaining sugar. Mix well. Gently fold in half of flour mixture. Add remaining flour mixture and 1/2 cup of mini chocolate chips and 1/2 cup chopped pecans. Gently fold to combine. Pour into an ungreased tube pan. Bake 35 to 40 minutes. To check if it is done, insert a toothpick, if is done if it comes out dry. Cool completely. Place on serving dish. Drizzle chocolate glaze over top (recipe below). Sprinkle remaining chocolate chips and pecans over top. In medium bowl, combine all ingredients. Add milk and water until desired consistency. Drizzle over cake. Preheat oven to 350 degrees. 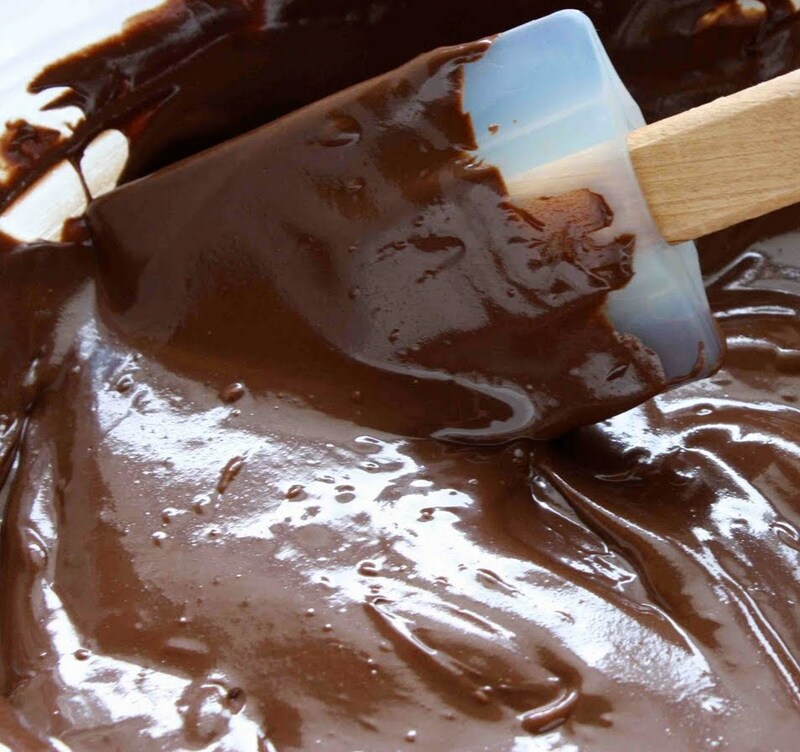 In metal bowl, set over a pan of barely simmering water, melt chocolate and butter. Stir until smooth. Remove bowl from heat. Cool until lukewarm. Add sugar and vanilla. Mix well. Add eggs one at a time, mixing well after each addition. Add flour and salt. Mix until just combined. Fold in pecans. Pour mixture into buttered and floured 13x9 inch baking pan, spread smooth. Bake 22 to 25 minutes or until toothpick comes out with crumbs attached. Cool completely. In large bowl, combine cream cheese and butter, using an electric mixer until light and fluffy. Add confectioner's sugar, vanilla, and mint extract. Mix well. Spread frosting over brownie layer. Chill 1 hour. In small saucepan, combine chocolate, butter, and cream over low heat, stirring constantly until chocolate melts. Remove from heat. Add vanilla. Drizzle over cream cheese frosting. Prepare brownie mix according to package directions. Bake brownie mix in 13x9 inch baking pan. Cool. Spread frosting over brownies. In large bowl, combine chocolate chips and peanut butter. Microwave for 1 minute, stirring after 30 seconds. Repeat until melted and smooth. Add cereal. mix well. Spread over frosting. Chill 1 hour. I have been at the Iowa State Fair for over a week now. 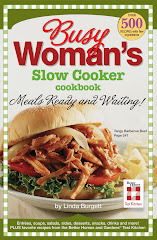 I am having so much fun talking to people about my cookbooks, and judging cooking contests. The three recipes I have posted won a dessert contest that I did not judge, but was lucky enough to try and get the recipes. 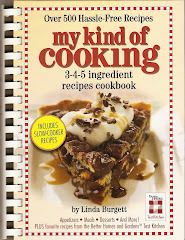 My favorite recipe of the three winning ones is the Triple Tier Brownies. I love the chocolate and peanut butter flavors that are blended into this easy recipe. I am at the Iowa State Fair and they are celebrating 100 years of the Butter Cow. 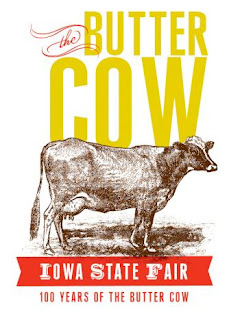 The Iowa State Fair has had a Butter Cow since 1911. The Butter Cow starts with a wood, metal, wire and steel mesh frame and about 600 lbs. of butter. It is constructed in a 40-degree cooler. Layers of butter are applied until a life-size butter cow emerges. It measures about 5-1/2-ft high and is 8-ft long. The 600 pound butter cow would butter 19,200 slices of toast and take an average person two lifetimes to consume. Most of the butter is recycled and is reused for up to 10 years. In honor of the Butter Cow, I decided to try the Deep Fried Butter. I waited in a long line of people, to try this unique food on a stick. They start with a pile of cold butter. It is the fair, so of course the butter must be put on a stick. The butter is next dipped in a thick batter. It is deep fried to a golden brown. I paid $4.00 for my Deep Fried Butter. I took a bite of the warm butter creation; exited to try the treat that was causing so much buzz at the fair. As I bit into the Deep Fried Butter, a gush of warm melted butter squirted into my mouth. Unfortunately this was not a pleasant experience for me. Paula Deen would probably love this, but I did not. It tasted like an over buttered and soggy muffin. On a brighter note, there was another new fair food that I tried; the Red Velvet Funnel Cake. To be honest, I didn't notice much of a flavor difference from the regular funnel cakes. But after the mouth full of butter from the Deep Fried Butter, the funnel cake was a tasty treat. 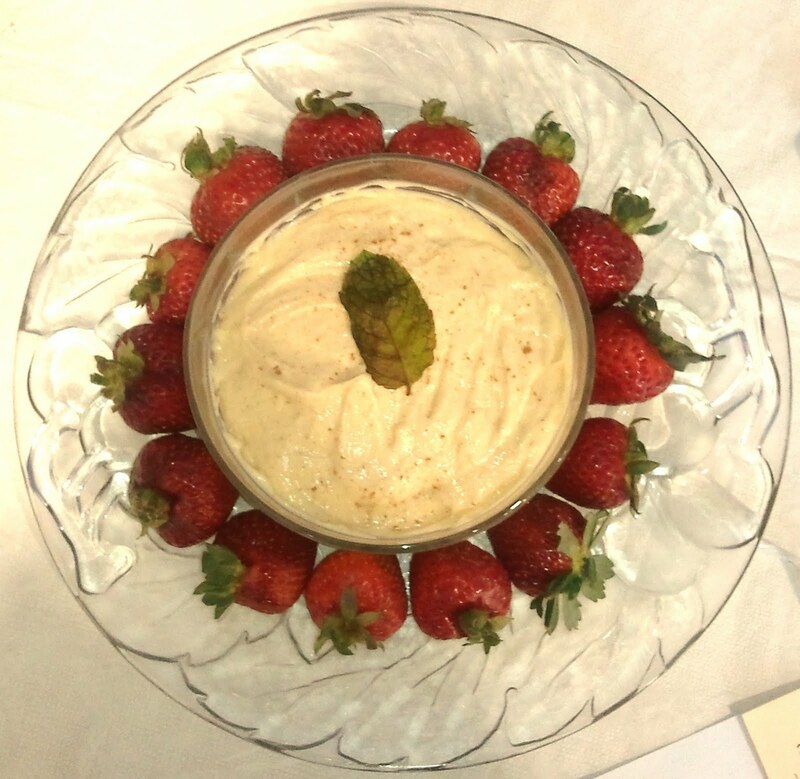 After all of that fattening food, it is time for a little Healthy Fruit Dip! My friend Deana, place 2nd in a healthy recipe contest at the fair. 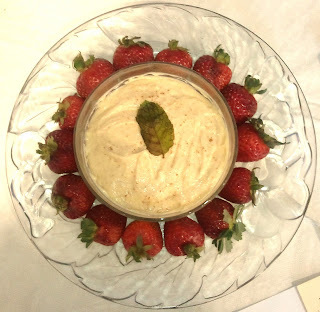 The dip is delicious and is so creamy, it tastes like it has cream cheese in it. Below is her prize winning recipe. In a large bowl, combine all ingredients. Mix well. Serve with fruit. Along with the healthy dip, how about joining the, “I Heart Summer Challenge.” It is a 2-week plan starting August 15th that will keep you looking and feeling great whether you’re at the beach or at home! Click the link below for more information. Also check out the Joy Bauer Food Cures link button on right side. Prepare macaroni according to package directions. Drain well, my mom says this is the key to making good Mac & Cheese. Return macaroni to the pan it was cooked in. Cube 3/4 of the Velveeta Cheese, add to macaroni. Add evaporated milk, milk, butter, salt, and pepper. Cook over medium heat until bubbly. Cook 3 to 4 minutes or until cheese melts. Preheat oven to 350 degrees. Pour mixture into 8x8 inch baking dish or deep pie dish. Slice remaining Velveeta. Arrange cheese slices on top. Bake 35 minutes or until golden brown. We can not have a family dinner without Mom's Mac & Cheese. This creamy cheesy comfort food is everyone's favorite and there would be riots in the kitchen if mom did not fix it. I had so much fun in Florida with my family! But now it is back to reality. I am in Iowa to promote and peddle my cookbooks at the Iowa State Fair. For the next two weeks I will be posting pictures from the fair and prize winning recipe from the contests that I will be judging.